Hmmm, good question, I thought. Best guess, around 5,000, but I’m not sure I know why I’ve settled instinctively on that number. What do I know for sure about our numbers in our profession, that could help me get close to an answer? Apra membership is usually around 2,000. My gut tells me that most people become Apra members or renew in years that they are going to the conference. Between big shops of 20 and little shops of one, maybe that’s a quarter of all potential members? About a third of all Apra conference attendees each year are first-timers. How does that figure in? That wasn’t a lot of data to go on to make a guesstimate. I had to do a little research. After lots of time online and talking with people, what I discovered made me blow a low whistle when I saw it on my spreadsheet. Over that same period, growth in the nonprofit sector as a whole was up 20%, contrasting massively with the for-profit sector which had a growth rate of only 2-3% according to a report by PNP Staffing Group. 50% of nonprofits surveyed reported staff increases. During the same period, Apra membership declined 3.4 percent. Wait, what? Apra membership declined? That makes no sense. Based on the number of nonprofits alone, but also the rate of growth in all of those other areas, including the number of fundraisers joining AFP, there should be more of us, not fewer. Right? I thought, okay, maybe it was just our international association that saw a decline for whatever reason(s). Maybe the growth was in the chapters. So I contacted my friends at NEDRA, which I know is a strong and thriving chapter, to see what the numbers had been for the same period. And what I learned is that, over that decade, there were declining numbers of NEDRA members as well. Here’s the table I created with data from the National Center for Charitable Statistics, ProPublica’s Nonprofit Explorer, the Bureau of Labor Statistics, Apra member numbers from past virtual business meetings, and my dear webfriend, Archive.org who helped with the CASE and AFP historical numbers. Even if you’re not a chart person, you can see from that “Change over decade” line that something is up. Or down, as the case may be. I don’t believe it’s that Apra and NEDRA aren’t offering valuable continuing education, networking, and other member benefits. But everything around us is growing fairly substantially. Why are we as a profession not growing, too? Well, maybe membership isn’t an indicator of how many prospect development professionals there actually are. Maybe people “age out” of our professional associations when they hit a certain level or add other layers to their job title. They’re still there, doing the work, just not a member of anything. Maybe they just don’t join to begin with, because they don’t know that professional membership associations exist for research, prospect management, and fundraising data science folks. Maybe organizations just put budget money into professional memberships for front-line fundraisers and not for prospect development. Or maybe our professional association membership fees are too expensive for the ROI (which, for the record, I don’t believe, since the cost is similar to AFP). It’s not that everyone isn’t getting membership dues paid – just not us. Maybe we’re not very good at making a very good case for (our own) support. Or maybe (gulp) our profession is declining. It was too many Maybes. I needed to phone a friend. Has membership cost changed over time for these associations? 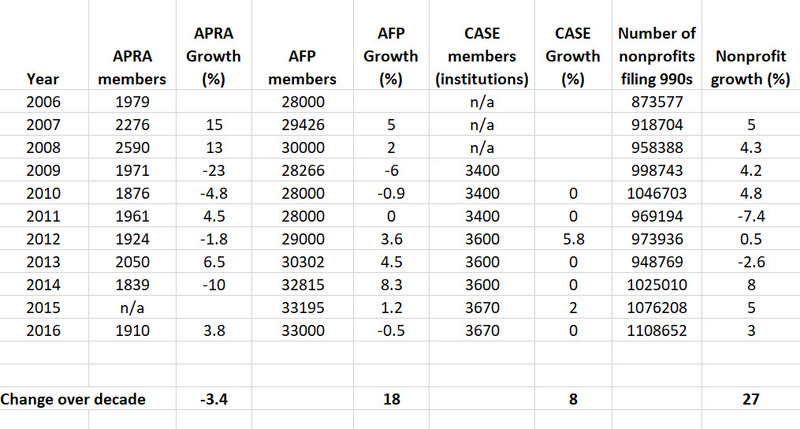 If rates haven’t gone up at AFP or CASE and they have at Apra and chapters, is that a factor in their increasing membership numbers? What is peoples’ engagement with Apra and chapters on social media and prspct-l? Has it grown over time? 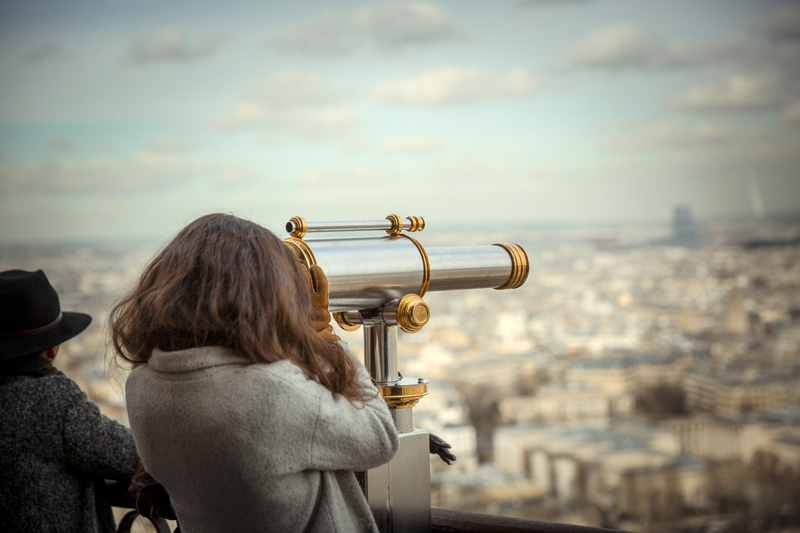 Social media engagement is free and could include not only people who are full-time fundraising intelligence professionals, but also those who do the work as one part of a many-hatted job. How many people follow these accounts or actively use the listserv? Are MOOCs and free podcasts a factor? All good questions but finding some of these data points is beyond my ken. So I’m back at the beginning. I have data, but no answers. How many people do you think there are currently in the prospect development field? Is this number growing or falling? Why do you think membership numbers in our professional associations is declining? As always, thanks for reading, and for your contributions. *Nonprofits are required to file a 990 with the IRS when they reach income of $50,000. Obviously, the smallest of these will not employ prospect development professionals, but this group overall hires both consultants and part- and full-time prospect development professionals.